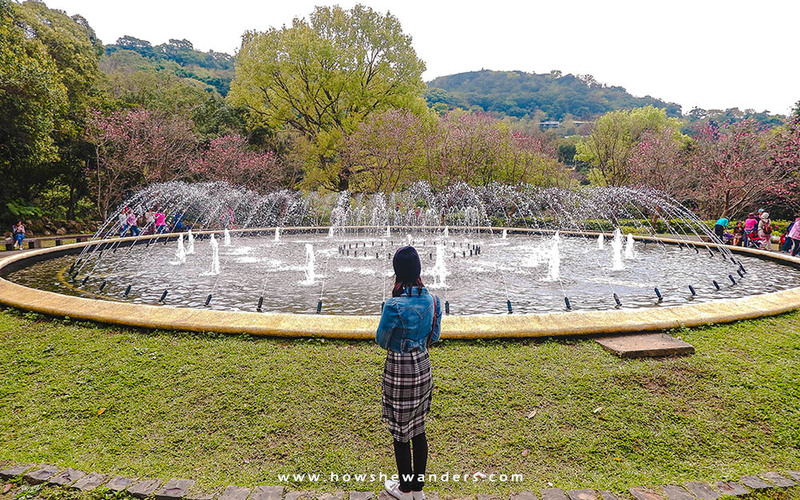 Our main goal for Yangminshan trip is to catch sight of cherry blossoms as I’ve heard that plenty of sakura trees can be expected to bloom in the said place. We actually had a flexible itinerary for our day 3. 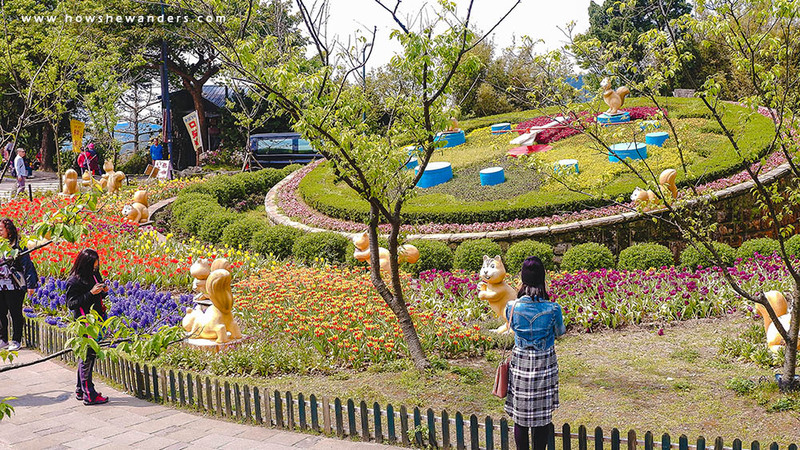 That in case we succeed in seeing cherry blossoms in Taichung on our day 2, we can skip Yangmingshan the next day so we can try other activities like hotspring trip (Tamsui) or cable car ride (Maokong Gondola). 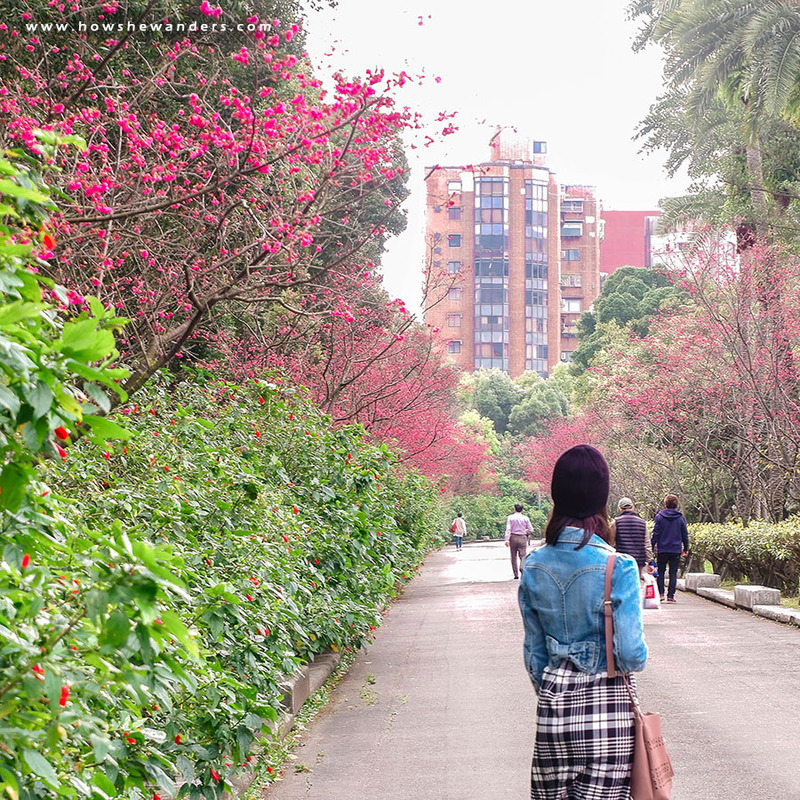 Since we had a wonderful cherry blossom experience in Taichung, we can head over to either Tamsui or Maokong Gondola instead of Yangmingshan. But I don’t know our Yangmingshan trip still pushed through. It’s just me sometimes I can’t understand myself either (magulo talaga ako minsan), and that’s how well I do know myself! Before we start our journey, we first had our tummies full at the buffet breakfast served in our hotel (King Plaza). This time, we had chicken adobo (surprise! ), plus other sides I ain’t familiar with, and of course whole wheat bread with choco spread (our favorite!). The adobo part made it obvious that they cater to many Filipino tourists (but they still don’t serve rice). We boarded the MRT at Zhongshan Station (red line) and alighted at Jiantan Station. From there, we took an R5 Bus bound to Yangmingshan Bus Terminal. We used our EasyCards for the bus ride. It was fast and hassle free as you wouldn’t need to worry about paying an exact amount. Just one tap and you’re good to go. The bus ride was very comfortable, convenient, and—wait for it—quiet. It was so quiet that it feels awkward to talk. No problem for me as I’m so used to silence. But I guess the talky ones would find it boring. 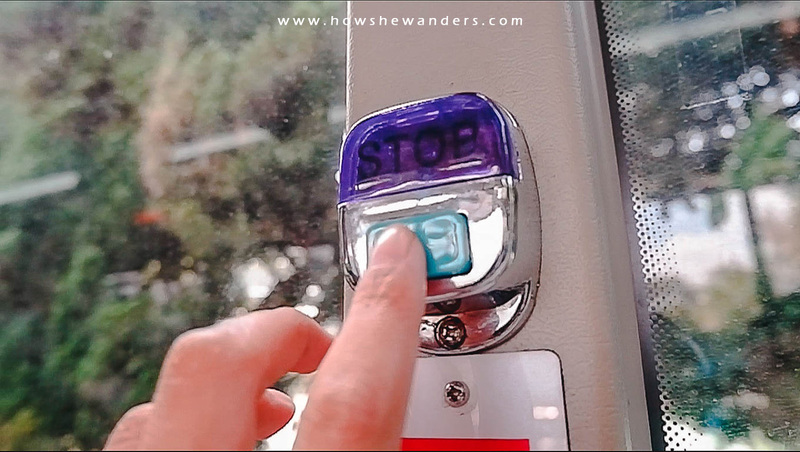 You wouldn’t even hear people prompt the driver to stop the bus as Stop Buttons were installed in every corner of the bus. Just one push then the bus will stop. Well at least the Philippine version is more exceptional. The louder you say “para“, the faster the bus moves! Another thing that I noticed were the cute stuffed toys hanging on the ceiling. I can’t imagine having those in Philippine buses. I guess you know why. We reached Yangmingshan bus terminal after roughly 45 minutes of travel. We headed to the famed Flower Clock which is about 10-min walk from the bus terminal. It was sunny yet cool which made our walk enjoyable. We saw cherry trees along the way but no more blossoms. Sad. The Flower Clock was not as big as what I expected, but it’s beautiful… and fragrant! I wasn’t sure if the fragrance came from the flowers because it was so strong but I also think that maybe it really comes from the flowers. I loved the smell that I almost didn’t want to leave the place. People were flocking into the place despite it was a working Wednesday. And because of that I had to leave the spot as soon as I could to give others a chance. Just near the Flower Clock, there’s a pathway going up that leads to the cherry blossoms area. I was so excited but upon reaching the place, there were no blossoms, not even a single one. Really, none at all. I’ve read blogs and watched vlogs about Yangmingshan cherry blossoms in which I learned that the season lasts until end of March or early April. So my hopes were high since it was still March 13. Then I learned that’s how unpredictable it really is. Nonetheless, we’ve had an awesome sakura experience the day before, more than enough reason for us to be grateful. 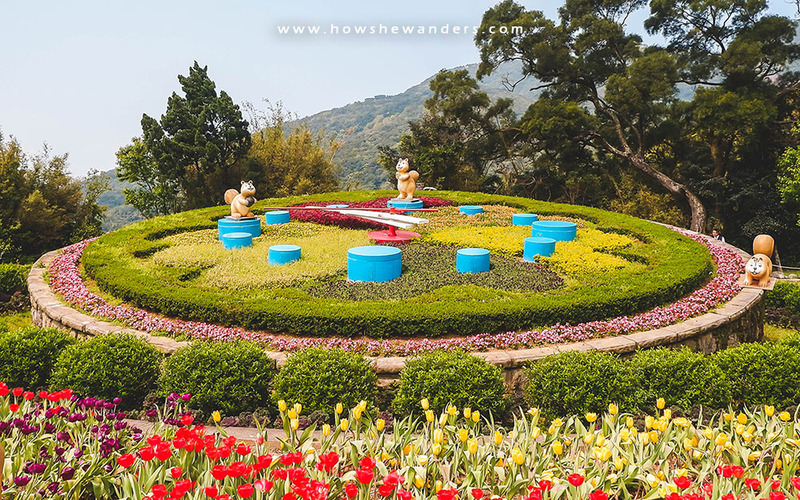 We then headed to the Yangming Fountain, just a 5-min walk from the Flower Clock area. We saw sakura trees circling the fountain. Some were in full bloom, some had few blossoms, and some were empty. I can only imagine how the place looks like if all the sakura trees were in full bloom. In my imagination, it looked magical. We just relaxed for few minutes while watching the fountain. I love fountains because of the relaxing ambiance it produces due to the sound of the water. 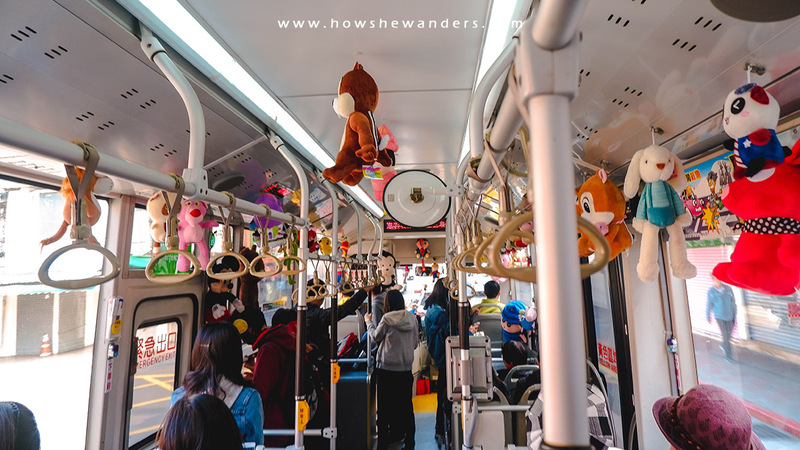 Since we still need to go back to Taipei as we failed to see Taipei 101 on our day 1 and that’s something we cannot miss to see in Taipei (you may read more about our day 1 here), we proceeded to the bus terminal where buses bound to Taipei City loads passengers. It’s just on the other side of the road from the Yangming Fountain. The bus arrived after about 30 minutes of waiting. We reached Taipei Main Station after 45 minutes of travel. It was lunch time and we were craving for rice but anywhere we looked, no one serves rice. Not even in KFC or McDonalds! I suddenly missed my Jollibee! We just settled for TKK Fried Chicken at Taipei Main Station. Since we couldn’t read anything from the menu (again) and I was too hungry, I just let Jeric decide which to order. I was in the state wherein I didn’t want to think about anything. Looking at our food, it really didn’t seem to have rice of any kind. Not until I ate the one in a toothpick. It’s actually a fried chicken skin stuffed with rice! And it was the kind of rice that’s so sticky and feels so heavy in the tummy. I felt my stomach leap for joy! 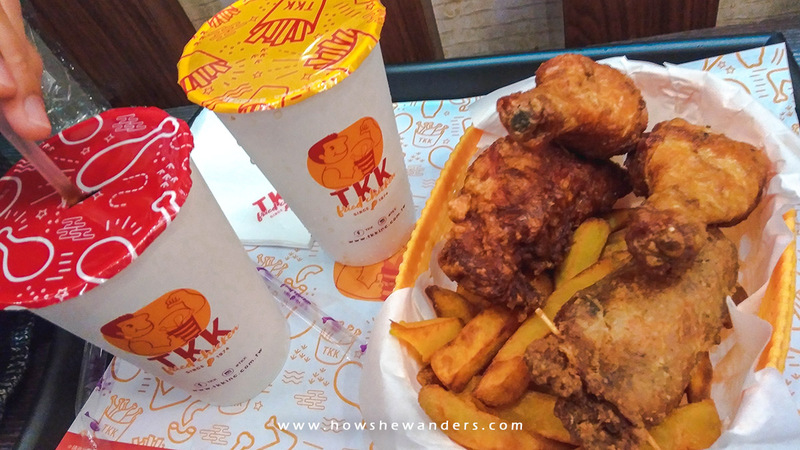 Jeric ordered a set for two which includes 3 pcs fried chicken, sweet potato fries, drinks, and the unexpected rice (as per my research, it’s called Kwa Kwa Bao). We boarded the train from Taipei Main Station (red line) and alighted at Taipei 101/World Trade Center Station. 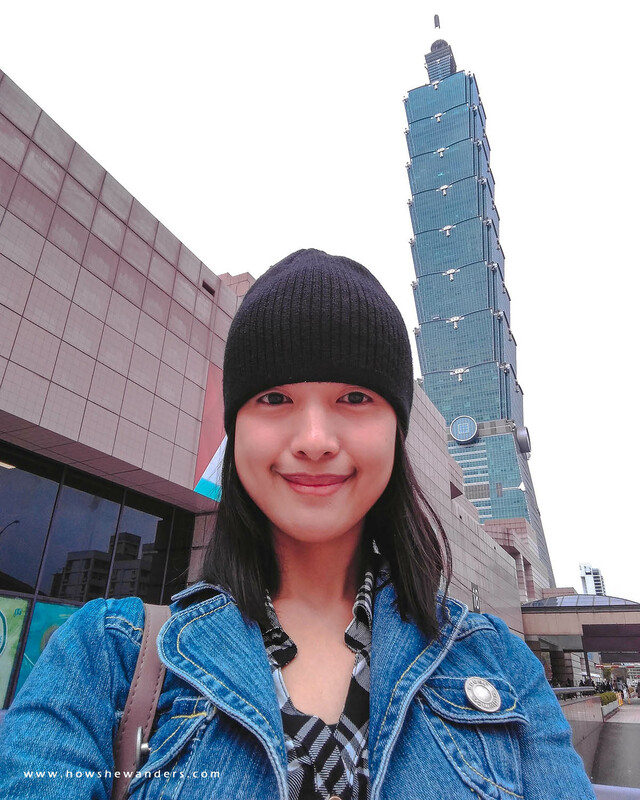 Upon exiting the MRT, we were instantly greeted by the view of Taipei 101. It looked really grand! 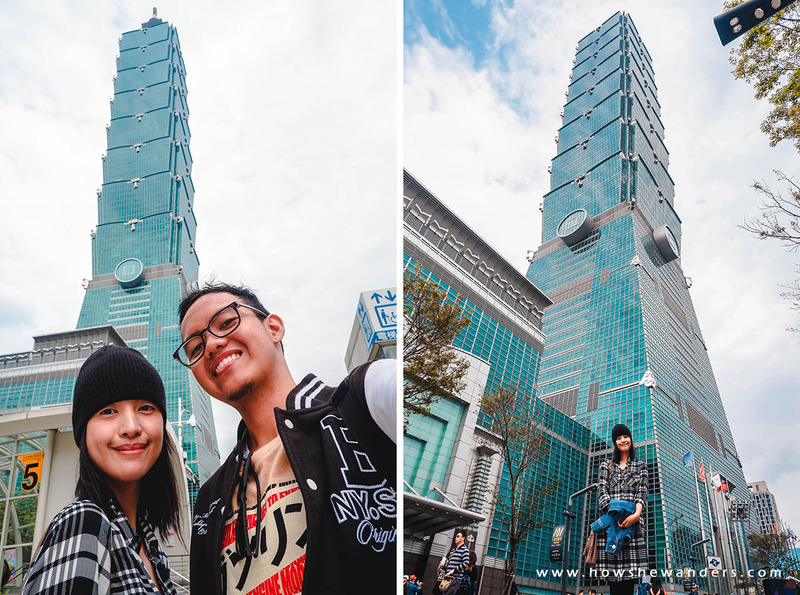 We walked a little more to reach the building to have the most awaited photo-ops with Taipei 101. 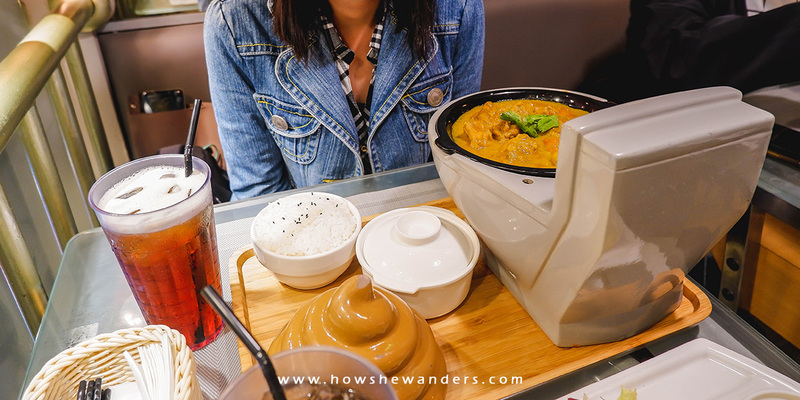 Actually, we were supposed to avail the Taipei 101 Observatory wherein we could experience how fast the elevator moves and have a breathtaking view of Taipei City at the top. But since I’ve heard that there’s no guarantee that we will have an amazing view at the top due to fog, we decided to skip it. 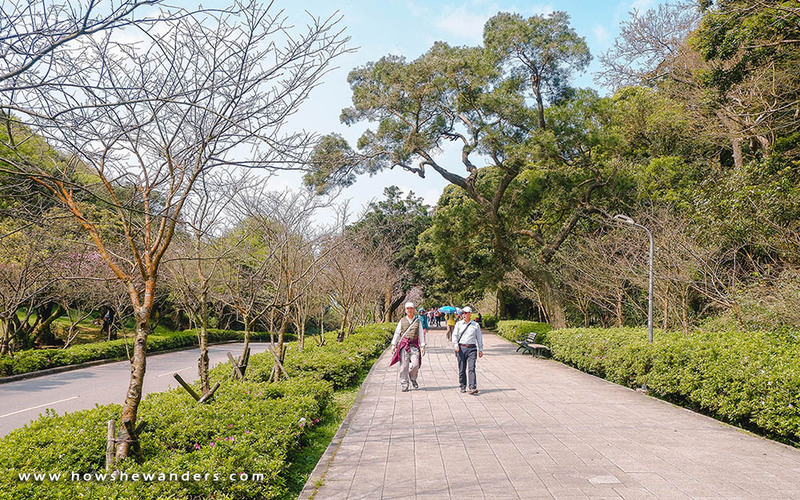 After taking lots of photos to our heart’s content, we then walked our way to National Dr. Sun Yat Sen Memorial Park which is just 5 to 10-min walk from Taipei 101. 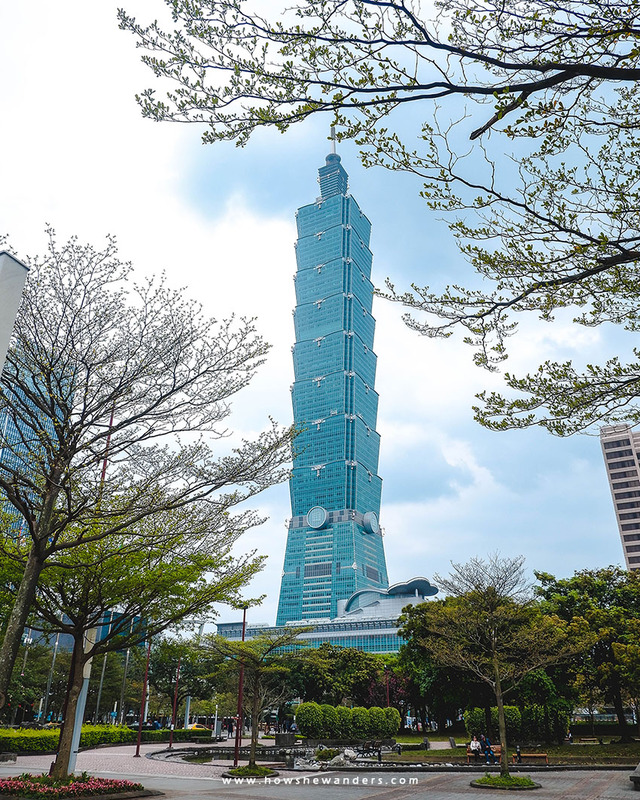 We took a photo of Taipei 101 from afar while walking to National Dr. Sun Yat Sen Memorial Hall. There were too many people at the memorial hall area so we looked for a spot away from everyone. We walked to the park/garden just in front of the memorial hall and we were happy for the IG worthy angle we’ve got! 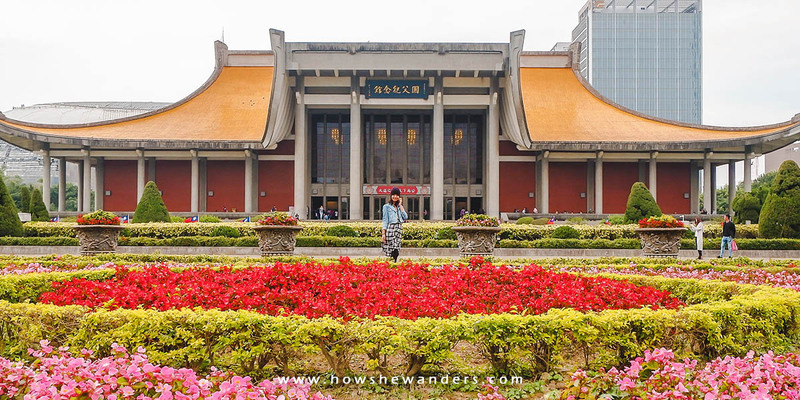 The memorial hall did not looked as well-kept as the Chiang Kai Shek Memorial Hall. But it’s still a nice place to check-out and explore. We rested for a little while at the bench in the garden and it drizzled. Good thing we were sitting under a huge tree. When the drizzling stopped we wandered around the park and look what we’ve got: A pathway filled with cherry blossoms on both sides! Not as flourishing as Chiang Kai Shek cherry blossoms but not as disappointing as Yangmingshan’s. 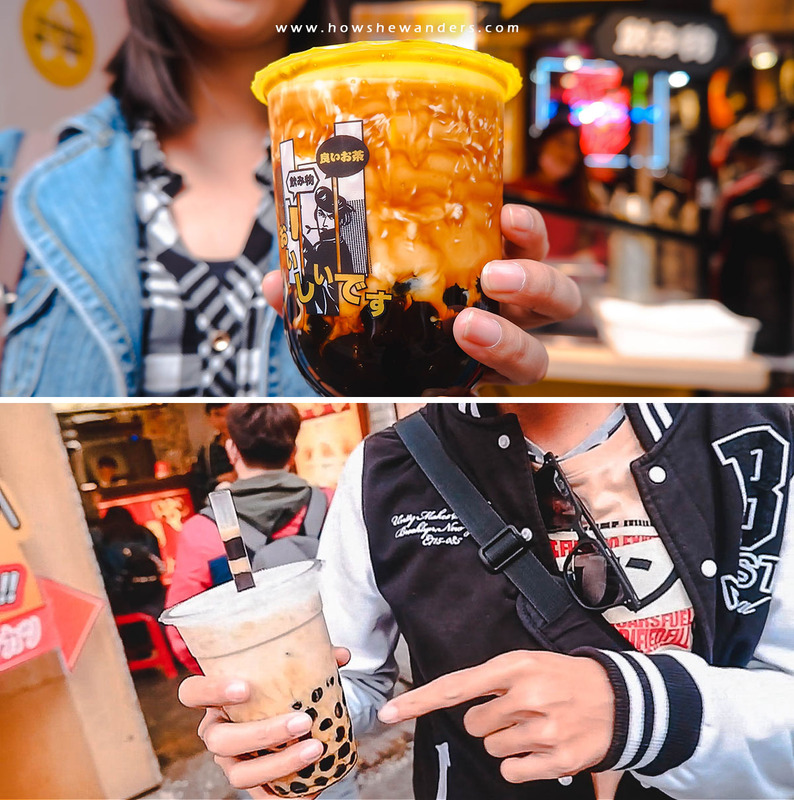 We boarded the MRT from Sun Yat Sen Station (blue line) and alighted at Ximen Station, then we walked our way to Ximending Night Market. It was too early for dinner so we decided to go for a Milk Tea hunt. We saw “Taiwan No.1” and “40 NTD” (we can’t read the store names) persuading customers as if they were rivals. Since we didn’t want to argue, we decided to buy 1 from each store. I tried the “Taiwan No.1” while Jeric tried the “40 NTD”. Upon having our first sip, we learned that they were not Milk Teas. No tea at all, more like brown sugar and milk only, quite disappointing. But for me, the “40 NTD” tasted better than “Taiwan No.1”. The pearls were fresh and chewy. We explored the place until we saw the Modern Toilet Restaurant. It’s a themed restaurant with the toilet concept, which I will discuss the details on my next post. Stay tuned! 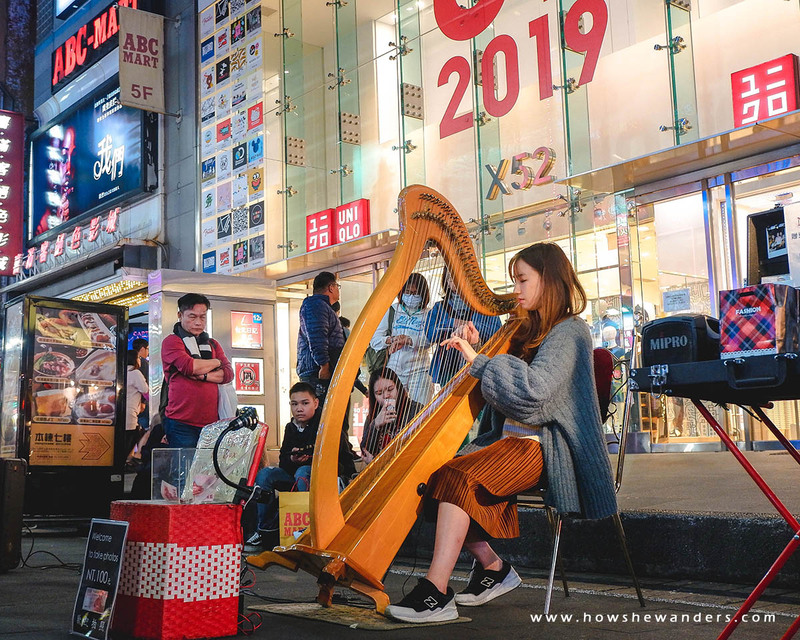 After having our dinner at the Modern Toilet Restaurant, we strolled around Ximending Night Market. It’s not as food-centric as Ningxia Night Market, but you’ll see here lots of stuff of different kinds. 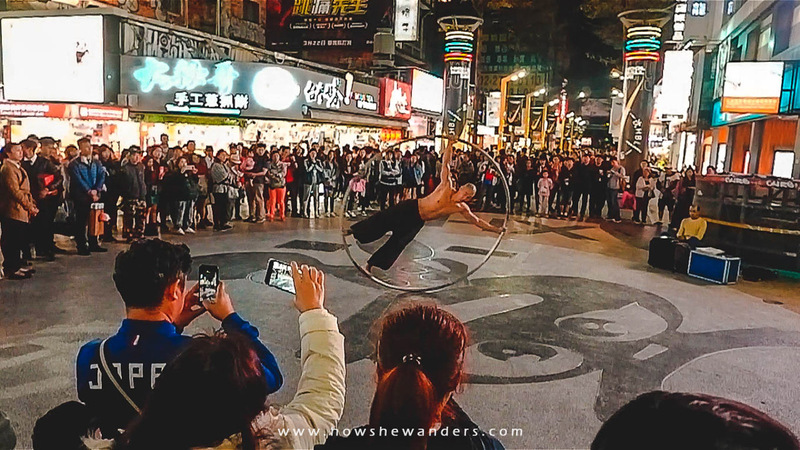 From clothes to food to shoes bags and accessories, and even live street shows! We were too entertained that we almost lost track of time. Tomorrow is another tiring and jam packed day so we decided to go back to our hotel so we could fully recharge our energy for the next day. We boarded the MRT at Ximen Station (green line) to Zhongshan Station. We had a quick revisit at Ningxia Night Market to buy our favorite Grilled Chicken Roll. And of course, we ended our day having Milk Tea by Mr. Tea (again) just below our hotel (King Plaza). And that’s our Day 3. I hope you’ve picked up something from our experience. Until the next posts! Interesting places! I miss Taiwan I have lived there for 3 years in my early 20’s.